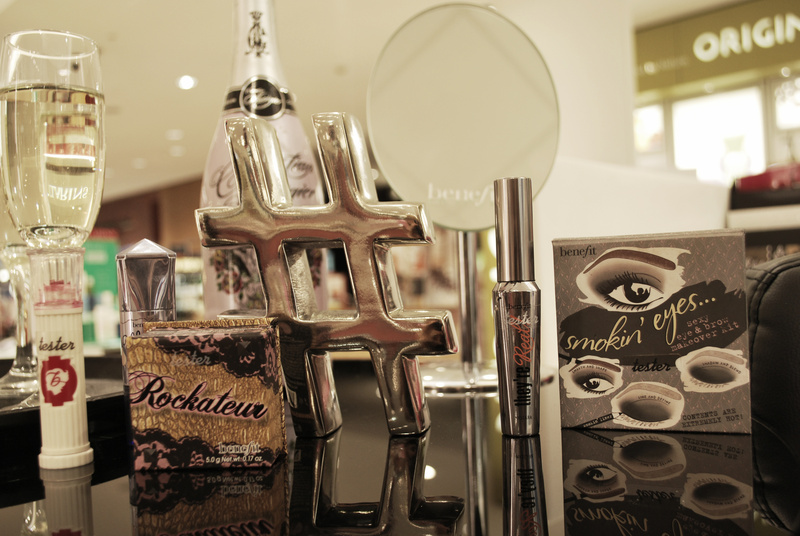 Benefit at House of Fraser Bristol kindly invited some local bloggers for an evening of makeup, wine, cakes and sweets in order to introduce us to the rocking world of Rockatuer, Benefit’s latest blusher. As Benefit fans, it was hard to resist an evening of indulging in all of their pretty offerings! We both LOVE makeup but are by no means experts so it was really useful to watch the Benebabes, the lovely Lucy and Kate, demonstrate how things should be applied. We both find buying makeup quite an overwhelming experience. There’s just so much choice and I (Jo) am usually far too self conscious to ask for help from one of the assistants. I have tended to go for Benefit purely because I like the packaging and I’m pretty sure I’m not alone here! Thankfully for me, Benefit packs just as much substance as it does style! Lucy showed us how easily the Rockateur blush, which is £23.50, can be layered up to take it from daytime wear to an evening look. We were both really impressed with the beautiful rose-gold colour and how nicely it lifts the face. Benefit describe this blush as being for “girls who don’t blush easily” which perfectly fits the cheeky tone of the brand and is also true of the product! Lucy then used the Watt’s Up highlighter, £24.50, (which I loved so much I ended up buying – naughty!) to bring out Kate’s cheekbones and used the Smokin’ Eyes Kit, £28.50, to create a beautiful smokey eye. The look was completed with a quick swish of the They’re Real mascara, £19.50. Smashing. After the demonstration, we were all given the opportunity to have ours brows mapped. This involved measuring to find the exact points at which our eyebrows should be! After marking out the perfect points, Lucy used Benefit’s Brow Zings (£23.50) to create the new brow. The transformation was surprisingly drastic and we both loved our newly improved look! For me, it turns out that my eyebrow shape is as it should be but that I should add a bit of length! I’ve already got quite a lot of brow so I was slightly unnerved about adding more but it turns out it’s a much better look!